In 2009 FriendFeed continued their dominance as the clear leader in the social streaming* space. But in the middle of the year when they were acquired by Facebook, their future path was largely in question and many users began seeking alternative services. FriendFeed has a pretty devoted community and while many continue to still use the service they are keeping an eye on any up and coming alternatives. Cliqset has become one of the top services now mentioned as a possible FriendFeed alternative and users appear to be watching them closely. Today they launched a slew of changes that continue shaping themselves as a premier social streaming service. They’ve re-designed the UI quite a bit making changes that provide a simpler and more straightforward experience. It also paved the way for some of the functionality to snap neatly into place which includes several great additions. File sharing is now available that also offers features within the service depending on the file type. For instance MP3’s will provide an in-line player once uploaded. Groups functionality has been added which now offers niche based areas to be created which are isolated and separate from the regular user streams. These can be used to create areas that revolve around hobbies, brands, or any other niche you can imagine creating a custom stream for. I see both of these features as evolutionary that now gets them closer to the standard feature set offered by FriendFeed and I’ll need to play with them some more to identify any distinguishing differences or nuances that make them different but these are important additions that helps get them up to par. The feature which is unique to them and the coolest in my opinion for this release is their Streams. 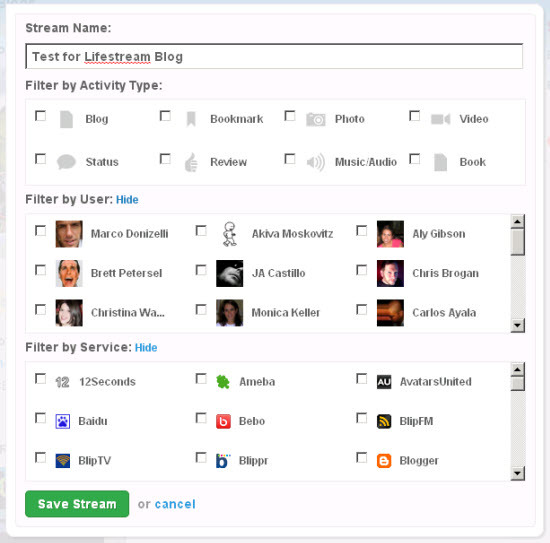 This allows you to create a custom filter that allows you to dial it in by Activity Type (blogs, photos, bookmarks, etc.) Users, and Services. This feature helps set them up for what I feel is one of social streaming’s biggest challenges which is to fine tune the meaningful content we want to see on a daily basis from the mountain of data coming in. This is a nice first step but I look forward to watching this evolve with some automated logic. They’ve also updated their Air client which although I haven’t tried yet, co-founder Darren Bounds gave me a demo and it looked pretty cool allowing a nice customizeable drag and drop column based interface that offered a way to organize the streams a little more effectively than the web app. And if you fancy yet another way to consume your streams they also released a fresh new Firefox extension as well. As if that’s not enough there’s also support for Boxee now! Louis Gray calls Cliqset the “Swiss army knife for Web service updates” and with all these new tools it’s easy to see why. But although these updates are all front-end consumer facing Cliqset has also done everything they can to implement open standards across the board within their platform including using Activity Streams and leveraging Pubsubhub. ReadWriteWeb also wrote about the efforts with their FeedProxy release to enable developers to take advantage of their platform. I feel that as technology continues to march on over the next year and FriendFeed not actively being devloped, Cliqset is in a great position. With their eyes focused on building an open standards based platform that is developer friendly, offering real-time updates functionality, and continuing to release features to easily share and create discussions around streaming content, Cliqset is on a path towards becoming the new king of social streaming services. If you’re already on Cliqset or going to join, you can connect with me on here. Good post Mark, I like where Cliqset is moving. I hope they grab more and more users. Cliqset looks pretty nice. I set up an account but for some reason Twitter doesn't import and Google reader has imported an old shared post but no new ones since I joined. I know this isn't a support channel for Cliqset (I've reported the issues on their Get Satisfaction page) but it shows that they have some work to do. Functionality aside, someone has to drag out that tired, old question. Where is this whole thing going? I see that they got $1.5 million in funding last June. How long will that last them? Is this service going to have legs? It's hard to know. I'd feel more comfortable about investing some effort installing all the apps and getting involved if they had a clear path to good revenue.